While talking to my friend Clayton, I asked if he had any specific meals that he looked forward to on any holidays or occasions with his family. His response was about a meal that he has every year on Christmas eve. Background Info: Clayton is from Manhattan Beach, CA, but his grandparents are originally from Italy, and then moved to the states. Clayton knows of this traditional dish because he has been having this meal ever since he can remember on Christmas eve. Context: Clayton told me about this tradition when I was talking to him before our class started, this was the first thing that he thought about when I asked him a question about if he had any traditional meals in his family. Analysis: I had never heard about this type of meal, I have other friends who have roots in Italy and I asked them if they had heard of this and they said that they have. I guess it is a very common thing across many parts of central Italy. I think this is very interesting and reminded me of meals that I have on Hanukkah. “I make panchamrutham for puja [Hindu prayer]. It’s a sacred offering for God. So panch means 5, amrutham means nectar [in Sanskrit]. Five different things put together to make this nectar. So you put cow’s milk, yogurt, sugar, honey, clarified butter or ghee, and this is supposed to be the sacred offering to God. “It is made in a silver bowl. And, uh, this is supposed to be…how do they say? Theertham. God’s deity…you pour this panchamrutham over God’s deity, then pour it back into the silver bowl. Like you take a plate, put a small deity of God, then pour this panchamrutham. Then you pour it back in the bowl, and it becomes the…the sacred nectar for us. And you do it for special occasions. Special pujas. You don’t just do it every day. So for us, coconut water is sacred, and this is even more sacred. This recipe requires very much attention to specific details, and the informant was keen on mentioning that it is not an everyday recipe—it is only for very special pujas, or Hindu prayer sessions. The high specificity of preparations for making Panchamrutham show how important it is in the Hindu religion—it literally symbolizes the nectar of God. All of the preparations, therefore, are symbolic attempts to purify oneself as much as possible before creating something that will come into contact with God. The name itself shows that Panchamrutham is not a fancy recipe found in a cookbook—it has been passed down for thousands of years, and is known for being composed of five simple materials that have been prevalent in Indian cooking for all those years. The informant is my film partner (referred to as MR) who has a Jewish mother and was raised Jewish. This is the recipe his Jewish grandmother has passed down for Matzo Ball Soup. He said his grandmother was living in Florida before she passed, despite having lived most of her life in New Jersey in a primarily Jewish community. He says, Matzo Ball Soup is a Jewish dish served at Passover. The informant then looks at the recipe to remind himself of the steps. MR: She told me to put the eggs, schmaltz, chicken stock, matzo, ginger, nutmeg, and parsley in a large bowl. And then add in the salt and Allspice. Mix a little with a spoon, and cover and then place in the refrigerator overnight. I think this recipe is mainly interesting because it is recalled by heart by his grandmother. This shows how ingrained in the culture Matzo Ball Soup is. For his family and many Jewish families, Matzo Ball soup is a form of folklore in the sense that it is passed down through generations and verbally spoken and memorized. It is sacred in the sense that it commemorates a religious celebration (Passover). I asked my mom for any recipes that have been passed down/recipes that she did not learn from a book, but learned from others. She emailed me the following recipe, which was my grandma’s (her mom’s). 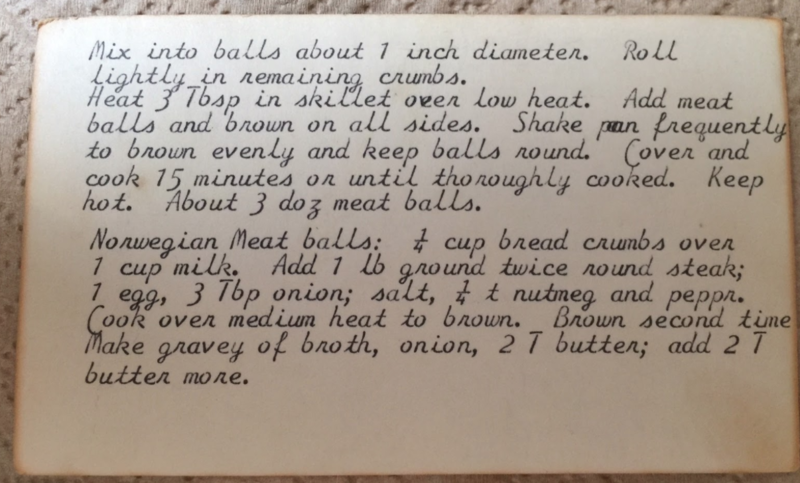 Photos of my grandma’s original typed meatball recipe index card are attached. Now, my mom makes this recipe every year for Christmas Eve. The recipe also includes how to make a gravy. 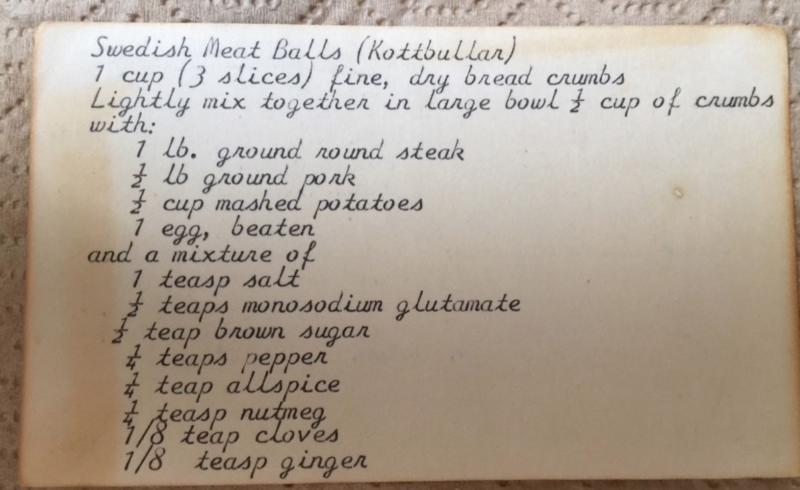 My grandma had Norwegian parents, but this recipe is labeled as Swedish with the Swedish word for meatballs, köttbullar, and Sweden and Norway are rivals, so I asked my mom about this discrepancy, as my grandma is no longer alive. AH is my mom, the informant, and PH is myself. PH: Do you know where grandma learned this recipe? AH: Her mother! Martha Hovda Haugen. From the farm [my great grandma, Martha, grew up on a farm], but I doubt they had veal?? PH: Do you know why they would have a Swedish recipe? AH: Well they call them Swedish meatballs, but since they [my family] were Norwegian, they [the meatballs] are really Norwegian!! PH: Do you know why the Swedish word would be typed on the recipe or why it would say Swedish? AH: Because people always call them “Swedish meatballs,” even if they are Norwegian. I use breadcrumbs and cream and onion, which is much simpler than that typed version, which I think is probably what mom and grandma Haugen realled used for everyday purposes. Also nutmeg. In Tucson, Arizona, a family passes down the tradition of making a very specific recipe on Christmas. This recipe has been passed down for so many generations, the actual author of the recipe is unknown. The source has said that it traces back to their Mennonite and Pennsylvania Dutch ancestors. The recipe was given to the daughters and daughters-in-law of each generation as a rite of passage for becoming the official “woman of the household”. Every Christmas morning, those with the recipe would cook these cinnamon rolls for the entire family and those celebrating the holiday with them. Unfortunately, when asked to record the recipe for documentation, my source refused to even let me see it. The secrecy behind this recipe is extremely important to the family and is viewed as a way of creating a bond between the women of the family and a true acceptance into the family. Me seeing this would be devaluing its importance. I think this is a really unique coming of age tradition. Not only is it a way of cementing blood relatives as officially women, but it’s also a creative way of welcoming those who have married into the family. Because of this, I completely understand my source’s hesitance in letting me see the actual recipe. “Basically, I have a sweet tooth, and, uh, my wife really loves me, and she knows I love banana bread. She meets a lot of people in her office, because she’s a physician. Even though she doesn’t like me to be eating desserts, one of her patients is a good cook, especially in baking, and when she found out she had a banana bread recipe from her mother, my sweet wife asked her for a copy. “The patient gave my wife a printed banana bread recipe, and we never made a copy of that. Now, we’ve had it for 20 years, and it has all kinds of flour and oil stained on it. Whenever there’s a special event, like Father’s Day, we pull it out. In every bite, I smell my love for her! This piece of folklore is interesting because it combines a recipe with a physical artifact, used over and over and passed from person to person. The oil and flour stains on the photographed recipe show the great use it has been put to. 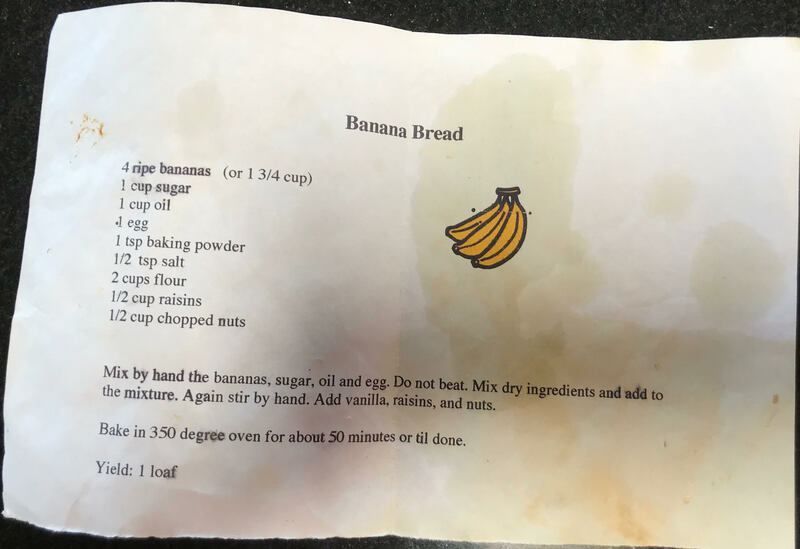 The recipe has almost become a folk object, because instead of ever looking at a photo or copy of the recipe, the informant’s family must pull out this exact object when baking banana bread. This origin story of a family recipe is super cool because it subverts two common tropes of family recipes: that they are long traditions passed down from the ancestors of the family, and that they are secrets. Not only did this family recipe start in a diner that the father of the informant just happened to work at of all places, but the informant clearly has no regard for who hears the ingredients, and they are listed very clearly above. Still, the recipe has quickly managed to become an important part of the family, so it makes me think that maybe this is the beginning of what will become a long family tradition with this family. Informant is grandmother, currently living in Florida having lived most of her life in New Jersey. The following is a family recipe for Matzo Ball Soup which is a traditionally jewish dish served at Passover. For this piece, I asked my nanny of 18 years, Mirna, for a recipe, and being native to Mexico, she delivered. She prepared beer battered fish tacos, which consists of frying a white fish meat in a batter made from bread crumbs and beer (Corona, of course). It is put into a taco with a chipotle sauce, cabbage, and salsa. I asked if there was a set recipe she followed but there was not, she just cooked based off how she had done it in the past. The entire time she was cooking she was adding little bits of ingredients here and there according to taste, and nothing was perfectly measured. Once the fish was battered it was fried in a pan with vegetable oil, not a traditional deep fryer. There was no set time to cook or anything of the sort, just judging based on the look of the food and feel based on the cook. This is a traditional recipe from my nanny’s home in Mexico, and she has been using it for as long as I can remember at home. It was a traditional recipe used when a successful fishing trip returned and would be cooked right away. She learned it from her mother, who would generally cook for all of her brothers and sisters, of which there were 6 of them. She had many recipes she could’ve chosen from, having grown up in this large family and also having cooking as a big part of life for them. There was never really much take out or dinners out, so it was typically home cooked meals from her mother. This time she cooked the meal for me, it was just one night for dinner, and did not have much contextual meaning. I used to fish a lot during the summer, and fresh fish was my favorite food for that span of time. I used to call my nanny as we were unloading the boat telling her what we had caught and she would prepare to cook it for me, and this became one of my favorite preparations of fish. She cooked a very large portion as it would serve as our family dinner that night, and had a sort of system going where she would be constantly breading the fish, frying it, warming the tortillas, and prepping the plates. She said that’s what it was like at home when her mother would cook for everyone, needing to feed many mouths. When this dish was being prepared, my dad had a few different beers at home but none were a Mexican beer, so my nanny actually went out and bought Coronas to cook this recipe, which I think is interesting in that even though I’m sure other types would have worked, it is more traditional to the recipe that she used a Mexican beer for the recipe. I had always thought this was just a random recipe my nanny had found and cooked for our family, but it turned out this was a recipe she had learned from her mother and brought here to cook for us. There are many more dishes my nanny knows how to cook from home and makes them constantly, but this one is hands down my favorite that she does.